Toy mashup: Darth Vader says … meow! 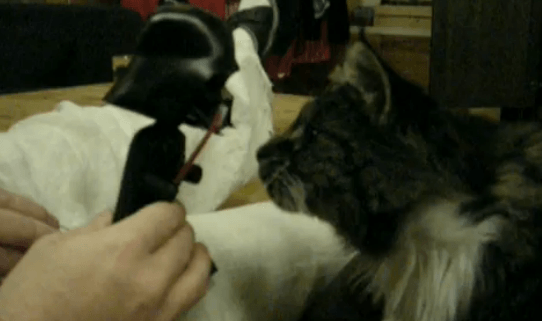 Not the most advanced mod but I liked how our “brave” cat reacted when I tested a meowing Darth Vader on him. I later learned that only kittens meow. Adult cats only meow to communicate their needs to humans, they won’t meow when communicating with each other. Instead the rely on body language, purring and growling. So when your cat meows at you, it is basically playing kitten with you. This is a first in a series of Mini-DIYs where I will try mashing up parts from different thrift store toys.